Jihad Watch : A Pakistani Muslim cleric has said that polio vaccinations are un-Islamic. And such “extremist” clerics are not just in Pakistan: in Nigeria, a Muslim cleric was arrested for playing a role in sparking the murders of polio workers. ISLAMABAD — Five-year-old Mohammad Ashar Aziz will never be able to walk without orthopedic leg braces. The youngest of three brothers from a village near Islamabad, he is one of just 17 children in the world — all of them in Pakistan or Afghanistan — who developed paralysis during 2017 from a wild polio-virus infection. His father, 41-year-old day laborer Hamid Aziz, is disconsolate because he repeatedly had the chance to immunize Mohammad Ashar for free during the past five years. 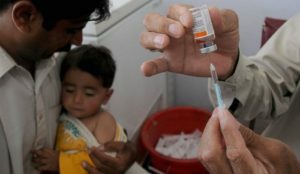 Instead, Hamid Aziz says he listened to the advice of a cleric in his village, who announced over loudspeakers of the madrasah, a local Islamic religious school, that the vaccine was “not good” for children’s health, and prevented it from being administered to any of his sons.